I’ve just bought the complete xpresspad course and I have akai mpd218. I just cannot figure out how to setup this pad with MPC essential. I know how to load the preset downloaded from your website onto the pad. Can you give me some pointers how to set up the pad to start learning? For example, the software that I can use to assign the mapping to the pad? Another issue is that when I start the eCourse, it appears that soundmanager2.js is not implemented and when I click the sample audio icon, an error page appears with nonsense characters. Please see the attachment for details. Many thanks for your purchase! Which audio player is setup as standard on your Windows, please? Is this a permanent issue or does it happen temporarily? Could you please try one thing: define a different standard audio player on your system? Regarding MPC Essentials I don’t have any experience, so unfortunately I cannot provide any support for it. I’ve tested it a couple of years ago but it was cumbersome to setup. Have you decided already to stick to MPC Essentials going forward or would you like to get started with a fully-equipped DAW? – I strongly recommend the latter, and there are free (or inexpensive) intro / lite versions of some available as well (for example Ableton Live / FL-Studio / Cubase / etc.). Hope this helps – please let me know. Regarding the DAW, I have downloaded Ableton live lite as it comes with mpd218 but I still havent figured out how to put the preset to the pad. This is really annoying since there is no just simple straight-forward tutorial to setup this pad with a specific DAW. Could you give me specific instruction how to put the preset on one of the DAW that you have so that I could follow? It sounds like you usually work on a Mac. Is that still the case? If so, I could give you the Mac version and the audio issue should be solved. It’s always difficult to solve specific issues when the “obvious” solutions have been tried, but failed… would you mind changing your standard system audio player just for testing purposes? Regarding Ableton Live Lite: The presets for the MPD218 needs to be loaded onto the Device itself via the AKAI MPD218 Editor which you need to download from their product website. Besides that, the only thing you need to do in Live is to go to Preferences (Ctrl + ,) Link Midi, and enable the MPD218 to be a midi input device. Once done, load your virtual drum kit onto a Track, make sure its mapping is “General Midi”, and you should be good to go. unfortunately, I dont own any macOS device, I mainly work with linux-based systems. What do you suggest for the audio player? 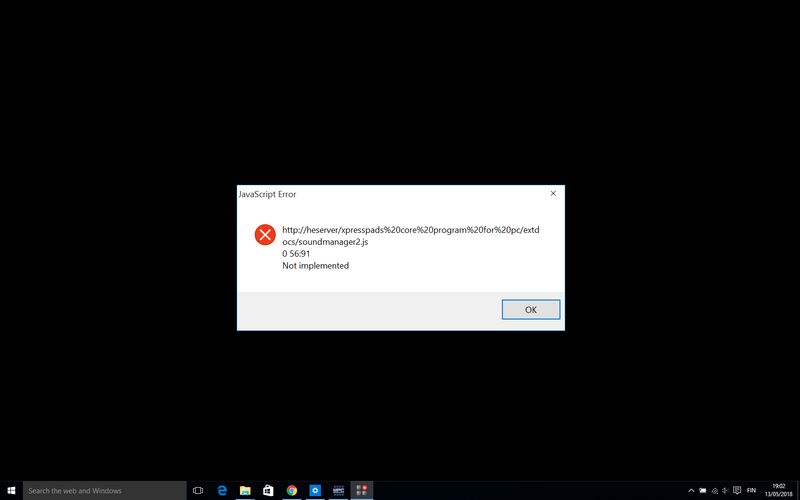 I cannot figure out how to install windows media player and I think it has been removed from windows 10. What are the audio configurations in your windows 10 machine? As I look into the error message box, the problem might be of the relative path of soundmanager2.js. I think the program is built as a portable executable but maybe it should be put in a specific directory? regarding ableton, can you elaborate on the final step to load virtual drum kit? I cannot figure out how to do it. By the way, I would really appreciate it if you can assist me through any instant messenger platform. and got it working somewhat. With that I basically loaded the proper samples in two slots each based on the XpressPads layout. However the software is really strange.